Pulaos are easy to prepare which are loved by many especially kids and perfect for lunch box too. 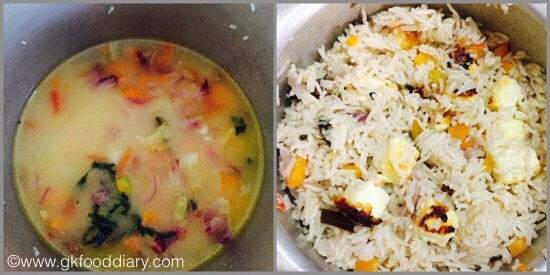 If your toddler/kid is a fussy eater and if you are taking all pains to make different types to sneak in healthy foods and veggies, then here is one kind for you, paneer pulao with vegetables. 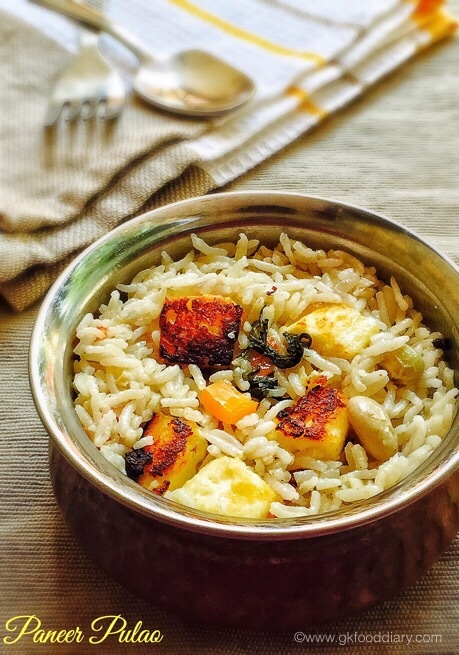 This paneer pulao is mildly spiced and tastes delicious. 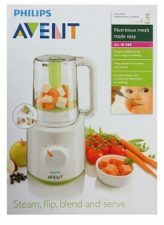 It can be given (without salt) to babies from 10 months after your baby starts eating with the family. It’s one of my daughters favorite. Do try this and hope your kid too enjoy 🙂 . 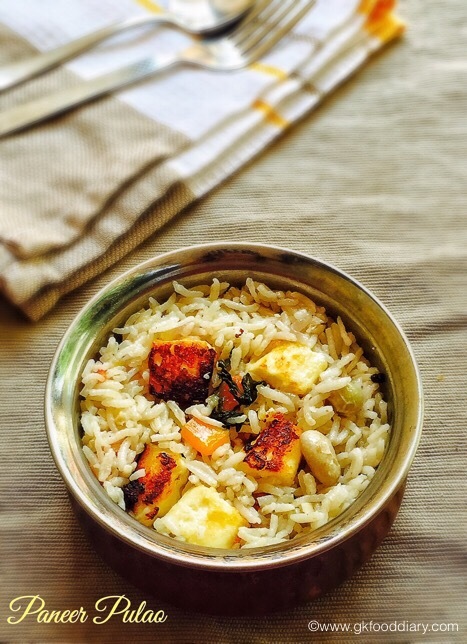 Let’s get on to check how to make this easy paneer pulao for babies, toddlers and kids. Measures ½ cup of rice in a measuring cup and wash the rice twice. Soak it in water for 15 minutes. Set aside. Wash and Chop vegetables, mint leaves and corainder leaves. Chop the onions length wise and finely chop tomatoes. Keep everything ready. 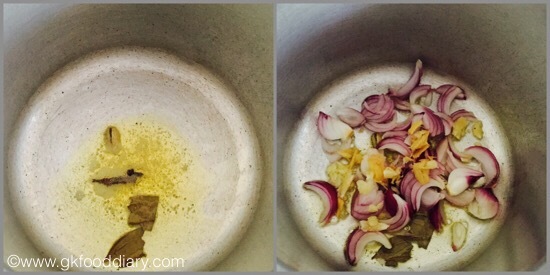 Heat a small pressure cooker with ghee and add bay leaves, cinnamon, cloves, cardamom. Saute it for 2 minutes and add onions along with ginger garlic paste. Saute them nicely until golden brown. Once the onions becomes golden brown and the raw smell of ginger garlic paste leaves, add tomatoes. Fry them until the raw smell of tomatoes leaves. Then add the coriander mint leaves along vegetables and garam masala. Mix them together and saute them for 3 minutes. Now add curd and mix well. Then add the soaked rice to the gravy along with salt and fry them for a minute. Add required amount of water and bring it to a boil.Close the lid of pressure cooker and cook everything in a medium flame for two whistles. In the meantime time fry the chopped paneer cubes in a tsp of oil until golden brown. Once the pressure releases, open the cooker and add fried paneer cubes and mix well. Keep the cooker closed until serving. 1. Measures 1/2 cup of rice in a measuring cup and wash the rice twice. Soak it in water for 15 minutes. Set aside. 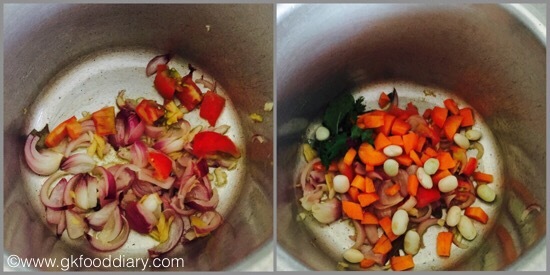 Wash and Chop vegetables, mint leaves and coriander leaves. Chop the onions length wise and finely chop tomatoes. Keep everything ready. 1. 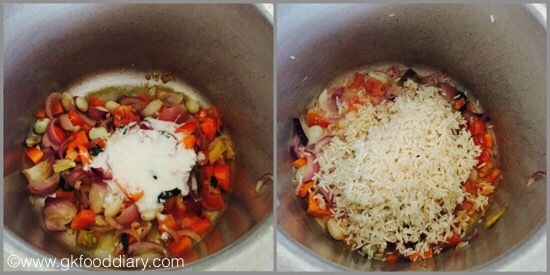 Heat a small pressure cooker with ghee and add bay leaves, cinnamon, cloves, cardamom. Saute it for 2 minutes and add onions along with ginger garlic paste. Saute them nicely until golden brown. 2. Once the onions becomes golden brown and the raw smell of ginger garlic paste leaves, add tomatoes. Fry them until the raw smell of tomatoes leaves. Then add the coriander mint leaves along vegetables and garam masala. Mix them together and saute them for 3 minutes. 3. Now add curd and mix well. Then add the soaked rice to the gravy along with salt and fry them for a minute. 4. Add required amount of water and bring it to a boil.Close the lid of pressure cooker and cook everything in a medium flame for two whistles. In the meantime time fry the chopped paneer cubes in a tsp of oil until golden brown. Once the pressure releases, open the cooker and add fried paneer cubes and mix well. Keep the cooker closed until serving. Serve the paneer pulao with onion raita, the best combination or any mild gravy of your choice! 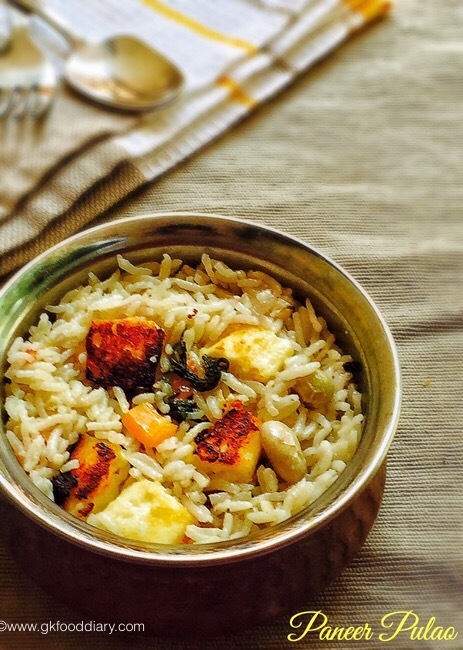 Normal cooking rice also can be used to prepare this paneer pulao. 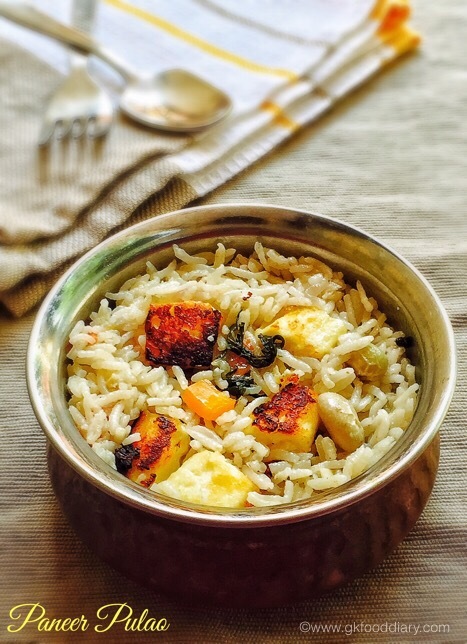 This paneer pulao can be prepared with coconut milk too. Add 1/2 cup of coconut milk and 1/2 cup of water. I used vegetables along with paneer to make it wholesome. U can prepare this pulao with paneer alone. Cooking paneer along with rice makes it rubbery and hence it’s recommended use fried paneer cubes. 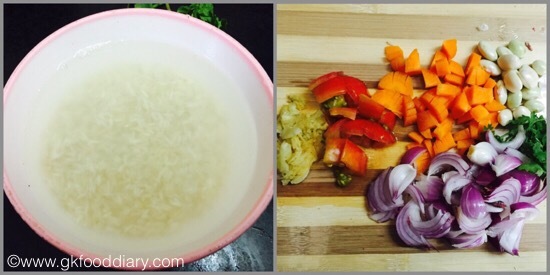 If you are baby/toddler won’t prefer whole rice, increase the water amount while cooking and give it in mashed form. Also take care to remove the whole spices while feeding.